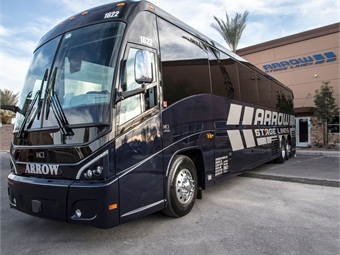 Family members, leadership team members, local Chamber of Commerce officials, vendors, friends, clients and team members were all present to help celebrate a historical moment for Arrow Stage Lines. 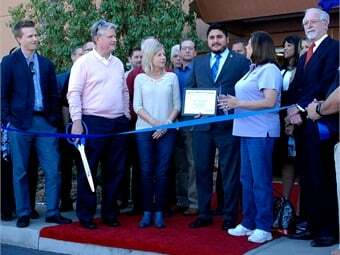 Arrow Stage Lines celebrated the grand opening of its newest facility located at 60 Corporate Park Drive in Henderson, Nev. The day began with a Driver Roadeo National Championship competition. The event consisted of written exams, driving courses and overall performance rankings. Drivers represented at the event, were the top finishers from each of their respective regions. After crowning Henry Winter, from the Southwest Region, the National Champion, the event proceeded with the new location’s official Ribbon Cutting Ceremony. Participants were able to enjoy tours of the new facility and pristine equipment, as well as horderves and conversations with Arrow team members, while enjoying “Vegas” flair. New MCI J coaches were on site, allowing attendees to experience the company’s new Kiel seat and robust interiors. 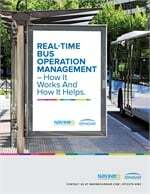 The company looks forward to a growing relationship with the community of Henderson, Nev., and continuing to provide confidence in transportation to Las Vegas and the surrounding areas.